Today we're spotlighting the very talented Chef Thomas Morris. You may recognize him as one of the finalists of the next Kitchen LTO 6.0 Pop-Up chef, but did you know he was an attorney for 17 years before he closed his practice to pursue a career in cooking? Chef Thomas Morris has been cooking all his life, but he only started cooking professionally about three years ago. Morris enjoyed working as an attorney/mediator, as it allowed him to help people. Now, he works as a chef, which allows him to make people happy. He says, "Good food makes people happy, and frankly, I like to make people happy." Currently, Morris works at the new upscale eatery in the Knox-Henderson area, Hibiscus, but also does private cheffing. 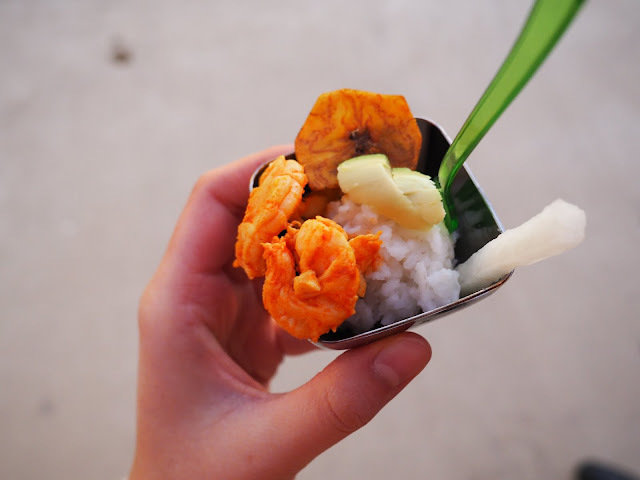 Last weekend, we got a taste of the Caribbean concept he envisions for the Pop-Up restaurant (as pictured above), and we were pleasantly surprised to try a type of cuisine we don't get to see too often in the Dallas area. And as it turns out, that is exactly what Morris hopes to achieve in becoming the next chef at Kitchen LTO. "I've been to several islands in the Caribbean. The food is light, bright, and full of flavor. It's not well-known here. I want to bring a touch of the Caribbean to Dallas." Click here to take a closer look at Morris' concept. As of yesterday, Chef Thomas Morris is tied for second place!! Best of luck to him as Kitchen LTO finalizes the votes and announces the 6.0 winners soon!